I started from the parking spots about 500m east of Glen Cottage (the only obvious habitation in the glen). A path leaves the road a short way east, just before the stream of the Allt an Doire Ghairbh. This soon crosses this stream and heads on up into the hanging corrie of the Toll a' Meithach, its high level of engineering being a boon as it clings implausibly to the bank of the stream while forging upwards at a horrendous gradient. 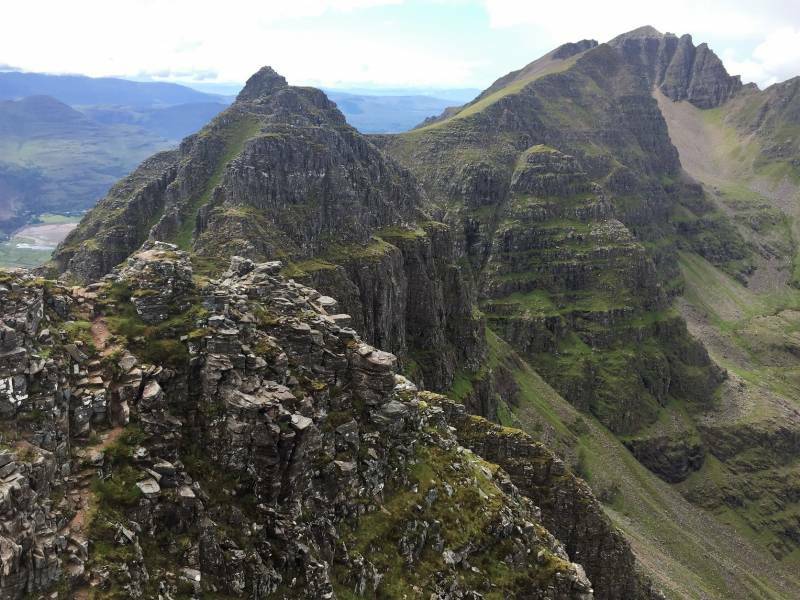 There is a choice at around the 550m mark as the stream forks: I chose the more conspicuous right hand branch so as to traverse the whole of Liathach rather than just aiming for the main summit. Higher up the path does a little easy scrambling before veering right to gain the ridge...just under 800m of climbing in 2km. 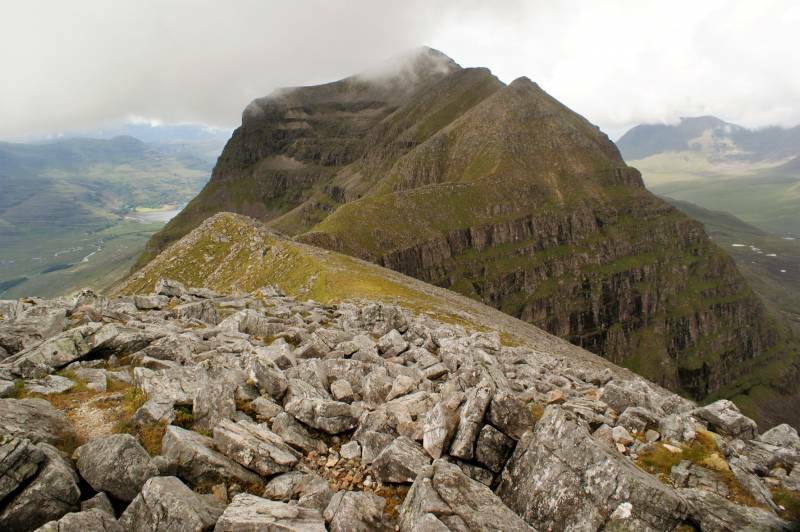 The view opened out north and emphasised how the hidden side of Liathach is even more impressive than its public Glen Torridon face, with massive cliffs disappearing into a succession of vast corries. I turned right to visit the eastern top of Stuc a'Choire Dhuibh Bhig before turning back west for the traverse proper. 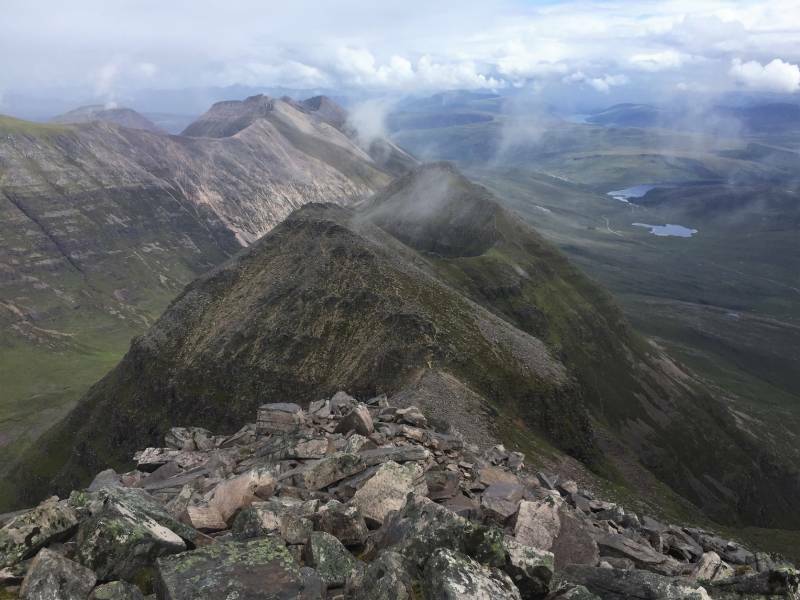 The ridge here is narrow without being intimidatingly so, the path running along the crest or clambering over piles of quartzite rubble (Torridon is mostly sandstone with quartzite intrusions). It's a rough pull over the double top of Stob a' Choire Liath Mhor and even more bruising quartzite en route to Spidean a' Choire Leith, Liathach's highest top. Up till now clouds had periodically brushed across the ridge but now they coalesced into a heavy rain shower...trusting the forecast I sat it out on the summit...I rather wanted to be able to see the next section! As the clouds broke up and the rain eased I picked my way down the loose rocks to the south west and admired/recoiled from the fun and games to come...Am Fasarinen, a succession of pinnacles on the crest poised above the yawning chasm of Coire na Caime to the north. It is possible to dodge these on the south side, but the bypass path is pretty exposed itself and has a reputation for being slippery. So I quickly went over the beta for the pinnacles themselves in the SMC's scrambling guide and stuck to the skyline. This was utterly absorbing, with hand and foot work separated by walking sections to manage the excitement levels. The hand and footholds were plentiful, and as a rule it was possible to work just below the actual crest if you wanted to. Finally a wander up a staircase of sandstone, gloriously airy, led to a level crest and a final clamber onto the Munro Top of Am Fasarinen itself. A few easy steps led down to more straightforward ground. 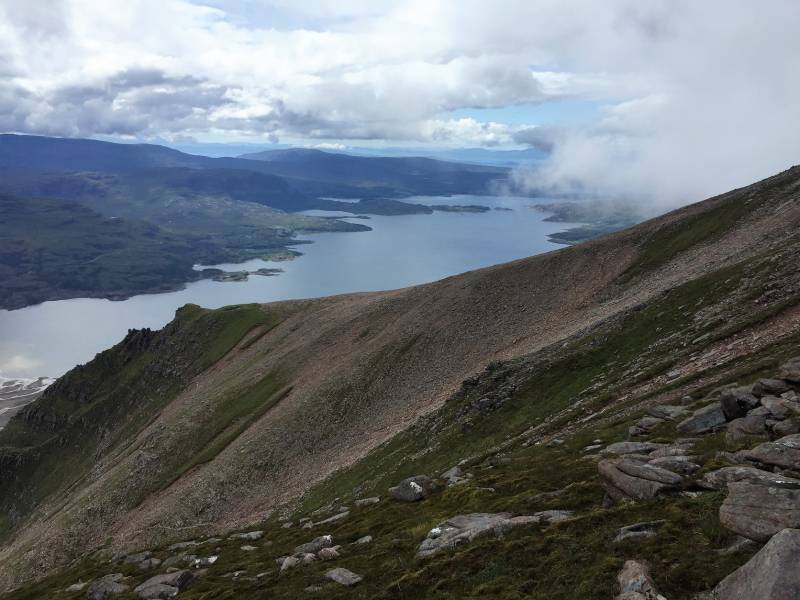 From now on the ridge is easy...the excitement comes from the sheer scale and magnificence of the views as you walk to the second Munro summit of Mullach an Rathain. 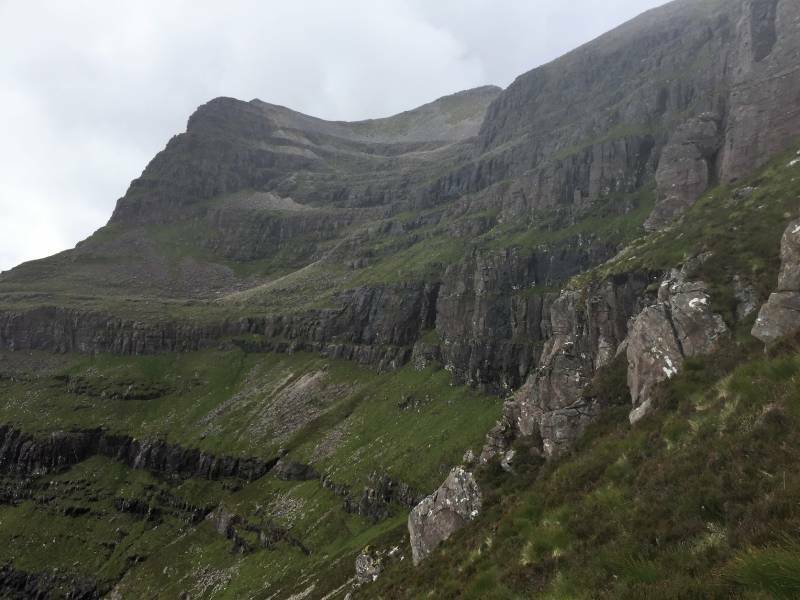 Behind you is the ludicrous ridge you just crossed, while in front the Mullach rises spectacularly across the yawning hole of Coire na Caime with the sea beyond. I walked across two intervening tops to Mullach an Rathain itself, paused to look down the tottering spine of the Northern Pinnacles below, before commencing the descent. This proved to be even more brutal than the ascent, going west for a short distance then south to contour the edge of the Allt a' Thuill Bhainn, before dropping down to the stream by a horribly loose zig zag path. Once the stream was reached the path become much better...a lot of work has been done on it. It's still a very long and steep descent back down to sea level and the road...boots had to come off to massage my toes on one occasion. A left turn and 2.5km of road took me back to my car.